It is a blend of ingredients that provides the ideal mix of texture and moisture retention to simulate the soils found in their natural habitats. The addition of pure limestone to the mix provides additional calcium if the substrate is eaten. 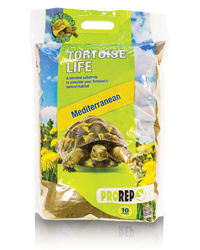 Directions: Spread the substrate evenly over the bottom of the enclosure to a depth of at least 2" (5cm)for young animals and up to 6" (15cm) or more for mature animals. Russian tortoises particularly may need a deeper substrate as they burrow extensively. Spot-clean daily to remove soiled substrate and replace completely every 2 or 3 weeks. Have used this for years. It contains sand/soil and little pieces of calcium, so hatchlings are safe and can be kept in appropriate conditions and humidity easy to control. Excellent product, at a very reasonable price. Need quite a lot to fill up our tortoise house, so had to buy quite a few bags. Blue Lizard Reptiles reply: There is now a larger size bag also available if you have a large enclosure. Doesn't come in a bigger bag, and I would be enticed to buy more if there was an offer for buying so many bags in one transaction.